It’s heading into winter and that means dark, short days and so, SO much rain. But don’t worry there are still plenty of things to do in Vancouver in winter. Evenings spent on the beach watching the sunset may be over, but winter means ski season, festivals, funky light events and new trails to explore. Below are some of the best outdoor and indoor activities in Vancouver this winter. 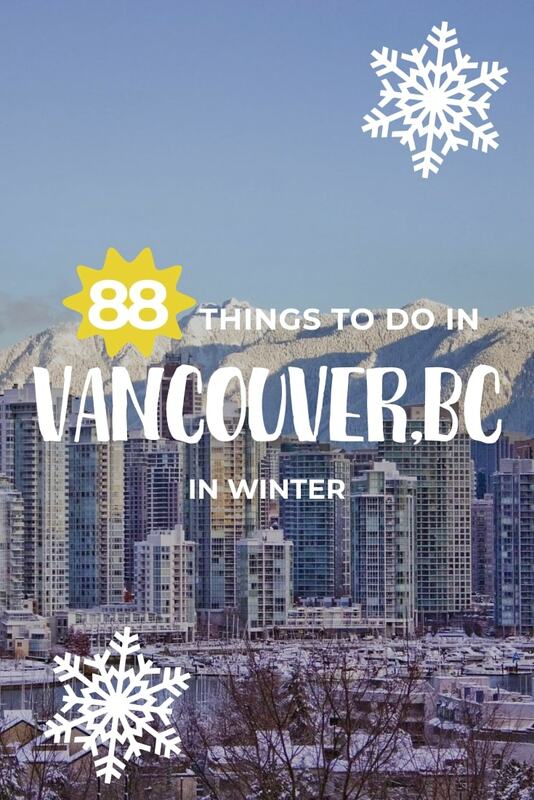 If you’re wondering what to do in Vancouver, BC this winter then wonder no more with this awesome list of the best things to do in Vancouver, BC in winter. 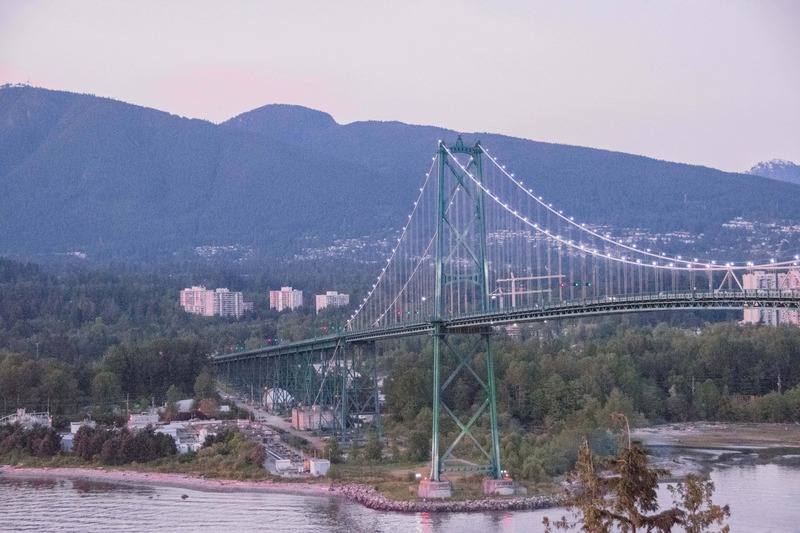 There’s plenty of activities here for your Vancouver to do list! Just because it’s colder doesn’t mean you shouldn’t be outside. Trying at least one outdoor activity this winter is a must do in Vancouver. There are loads of winter activities in Vancouver so plan an outdoor winter adventures this year! Cypress Mountain is our favourite local mountain for skiing. It’s the biggest one and it has lots of night skiing available too. Plus, from downtown Vancouver we can get there in about 30 minutes. How cool is that? If you’re looking for things to do in Vancouver at night don’t forget about skiing! Grouse Mountain is one of the top Vancouver points of interest. Some people prefer skiing or snowboarding at Grouse Mountain in Vancouver since it’s the closest to downtown. It’s easily accessible by public transport, but that does make it a little bit busier than some of the other local hills. If you’re not in to skiing or snowboarding it’s almost worth going up to Grouse Mountain in winter just for the view of the city lights and the other awesome winter activities that go on up there which are mentioned further down. Seymour Mountain is a great place to ski, especially if you’re a woman. Come January Monday night is women’s night at Seymour and all women can ski or board between 5pm-10pm for just $15! Plus, some of the money goes towards local women’s charities. The big one! 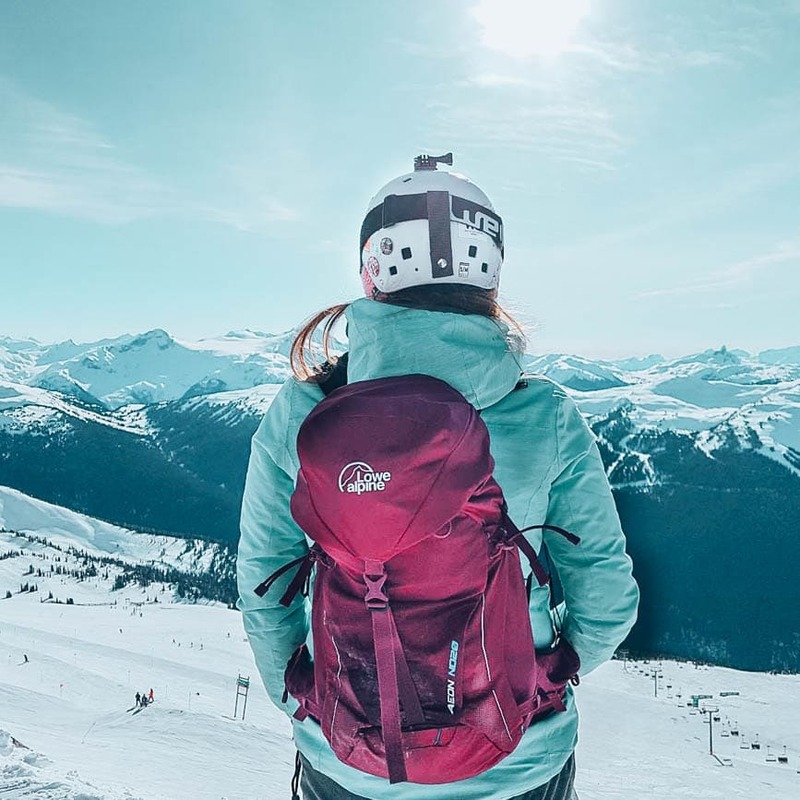 We’re planning on spending more days skiing up at Whistler this year. It’s renowned for it’s skiing worldwide and you only have to visit it once to see why. There are seemingly endless trails, always tonnes of snow and it’s good fun. Prices are expensive but it’s worth it even if only for one day. 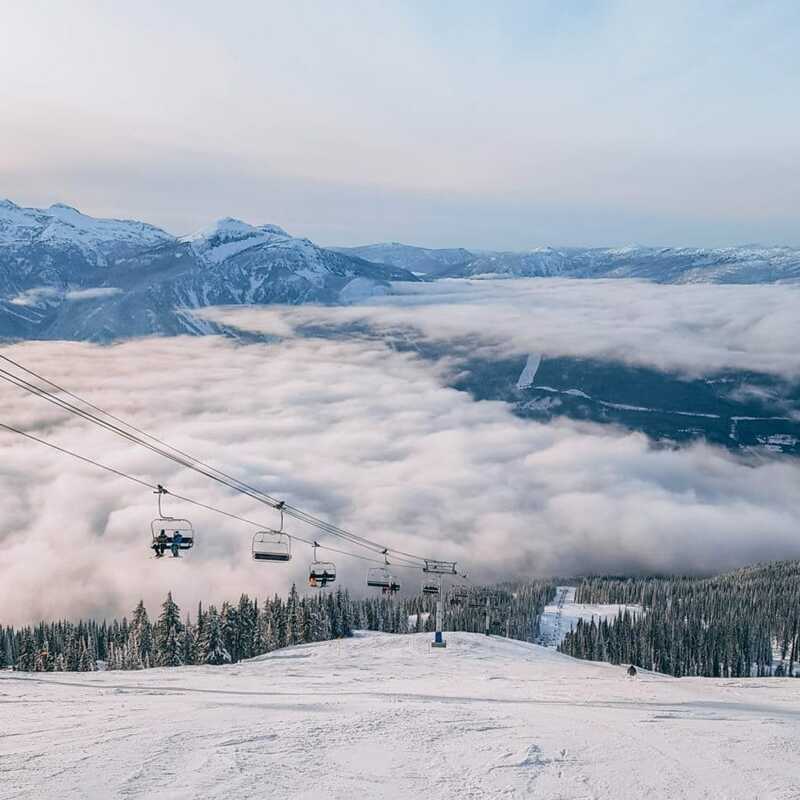 Plus, if you’re a BC resident you can get lift tickets for 50% on Family Day which is Monday February, 18th 2019. The North Shore is one of the best local places to go hiking in the summer. And this means it’s a fantastic place for snowshoeing in the winter. 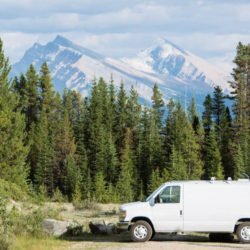 If you’re looking for well defined trails go snowshoeing up at Cypress or if you want something with even better views try out Dog Mountain. It gets busy on a clear winter’s day so start early or be prepared to be snowshoeing with plenty of other people! The Capilano Suspension Bridge is one of the top Vancouver tourist attractions and that doesn’t change just because it’s winter. Don’t worry about the short days since the canyon is lit up during winter. The suspension bridges and forest are even more impressive at Capilano during this time of year! It’s one of the best nearby places if you want to do some Vancouver sightseeing. You’re never too old to go tobogganing. Fact. Mt Seymour is the perfect mountain for some sledding fun near Vancouver this winter. What’s better than a zipline? A zipline over and past snow covered trees that’s what! This is just one of the fun things to do in Vancouver, BC this winter. 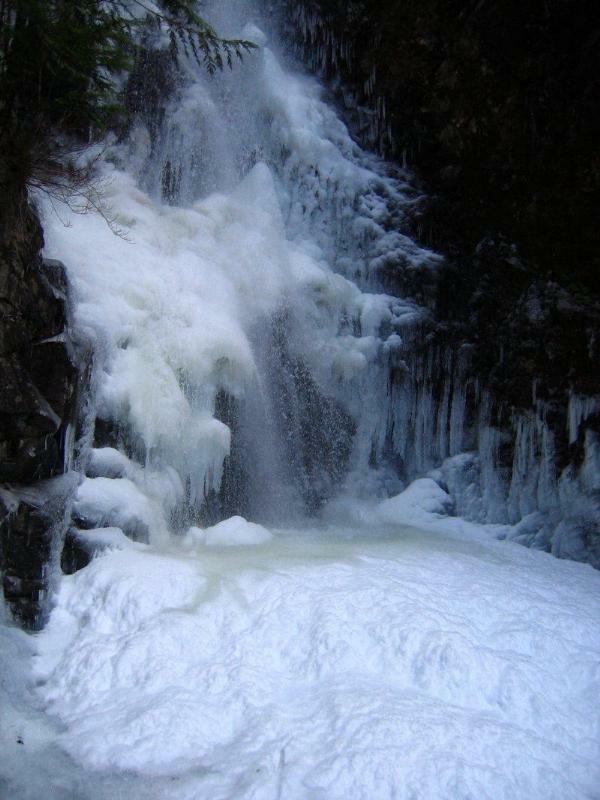 If it gets cold enough some of the nearby waterfalls freeze over and make for an amazing sight. One of the best ones to visit is Norvan Falls in North Vancouver. It’s a long snowshoe out there (14km return) and it doesn’t freeze every winter but it has been known to! If you’re celebrating a special occasion this winter then book yourselves on to a heli-skiing trip. This truly memorable experience will take you soaring above the Coastal Mountain range before dropping you off at the top of the mountain and skiing some powder. I took my first dog sledding trip in Revelstoke last year and loved it! I believe the ones at Whistler might not be exactly as hands-on but fun nonetheless! I’ve had the Elfin Lakes hike on my list forever and hopefully this winter is the season I finally do it. Hike out to the cabin, stay the night and head back through the snow. Just remember a super toasty sleeping bag! Cross country skiing is starting to appeal more and more to me. Maybe it’s age, maybe it’s the beautiful Vancouver surroundings. You can learn how to cross country ski up at the Nordic Area of Cypress Mountain which has many kilometres of trails. Want to head out into the backcountry this year or plan to do lots of adventurous snow shoeing? Make sure you’re trained in what to do in case of an avalanche. Hopefully you’ll never have to use what you learn but it’s good to know what to do just in case! 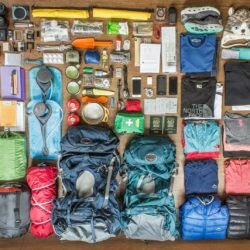 The nearby Mountain School has some courses available. Snowshoe and fondue? The perfect combination! Book yourself on to a snowshoe and fondue tour at Grouse Mountain and you won’t even have to prepare the fondue yourself! Plus the view from up here is incredible – gives you a whole new look at the top Vancouver attractions down below. 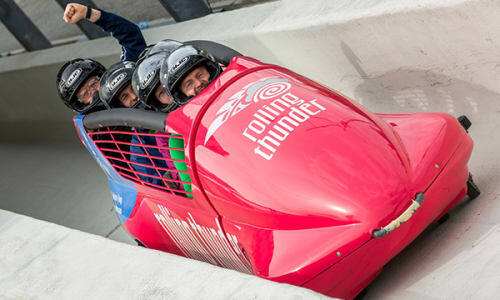 Ever wondered what it’d be like to bobsleigh or skeleton after watching the Winter Olympics? You can have a go yourself at Whistler where the 2010 Winter Olympics were held. It’s probably pretty scary but I’d bet it’s fun too! Fat biking is mountain biking for when it’s snowy. The bikes have super fat tyres so that you don’t just sink in the snow. I tried fat biking once in France and didn’t get on with it very well. However, now that I’m far more comfortable on a bike and have done some mountain biking in Squamish I’m sure I’d find it more fun. If it’s a clear day you’ll get amazing views from the top of the Sea to Sky Gondola. The mountains look even prettier with a dusting of snow! Cypress Mountain has some awesome snowshoeing tours during the winter including some evening snowshoe tours. You’ll be accompanied by a guide who’ll tell you interesting facts about the area. Then you’ll have a stop at Hollyburn Lodge for some hot chocolate and cookies before heading back. It doesn’t snow much in the city but when it does it’s super pretty and walking the city becomes one of the most beautiful free thing to do in Vancouver. Whether it’s snowed or not a great, free thing to do in Vancouver, BC in the winter is to take a walk around our beautiful city. Head around the seawall, Stanley Park or Pacific Spirit and take a flask filled with hot chocolate to warm up mid-way. If you’re an experienced skier and have done an avalanche safety course then head out on a backcountry adventure. 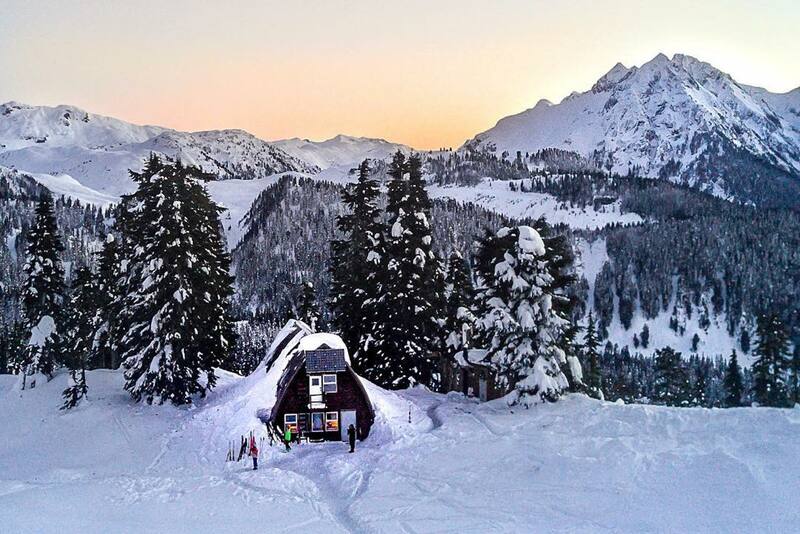 Some popular destinations in the backcountry are Keith’s Hut, Elfin Lakes and Mt Seymour. Christmas comes alive during the month of December in Vancouver. If you’ve bought your Christmas presents for the outdoors lovers in your life already, then enjoy these Christmas activities in Vancouver. These events are especially great if you’re visiting Vancouver with kids. What is there to do at Christmas in Vancouver? The Peak of Christmas sees Grouse Mountain turned into Vancouver’s very own North Pole. During the Peak of Christmas you can meet Santa’s Reindeer, go ice skating under the stars, take a sleigh ride, and go on a magical light walk around Blue Grouse Lake. The peak of Christmas opens from 23rd November – 6th January and should be on your list of things to see in Vancouver this winter. The Vancouver Christmas Market comes to town on November 21st and features more than 80 huts with German sweets, treats, and treasures in the Jack Poole Plaza in Coal Harbour. Eat pretzels, listen to carols and feel super Christmassy. Whether you’re looking for things to do with kids in Vancouver or you’re just a big kid, take a trip on the Stanley Park Christmas train this winter. The train is part of the Bright Nights event in Stanley Park (more info below). Your carriage will sparkle with some of over 3 million lights which light up the train! The Christmas train runs from 29th November to 5th January and costs $12 per adult $9 for 13-18 year olds and children 3-12 are $8. Just to attend the Bright Nights event is free. The Fly Over Canada experience at Canada Place is fun whatever time of year. It’s also a great thing to do in Vancouver when it’s raining since it’s indoors. For Christmas they mix things up and you can help Santa find his elves as you fly over a snowy Canada. Watch the Vancouver Christmas tree be lit up in early December. The event is usually combined with music, cookies and lots of festive cheer. The annual Vancouver Santa Claus Parade takes place on 2nd December 2018 at 12pm. The parade starts at West Georgia and Broughton and travels east, then south along Howe and finishes at Howe and Davie. 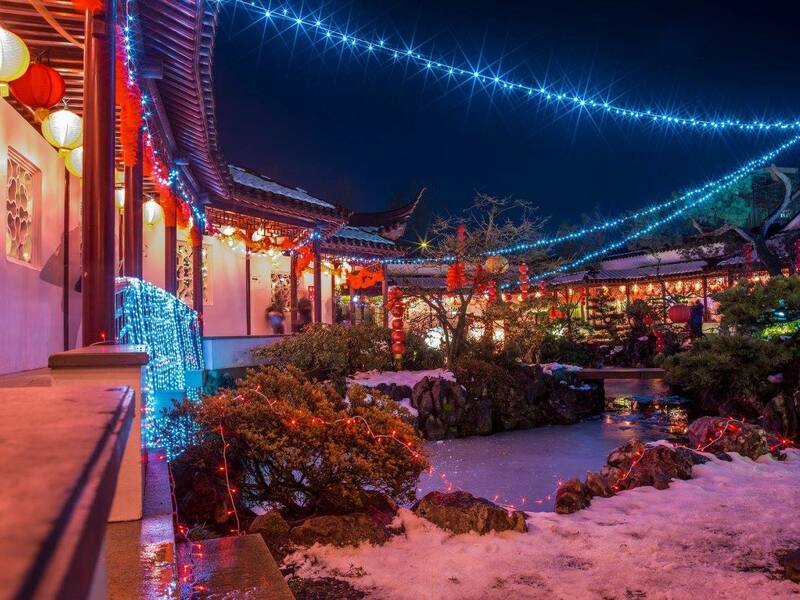 Celebrate Christmas in Vancouver’s Kerrisdale neighbourhood. Every Saturday in December there are fun Christmas activities on West 41st between Larch St. and Maple St. Look forward to brass bands, carriage rides, Santa and more. Christmas at Kerrisdale runs from 12pm to 4 and it’s all free. 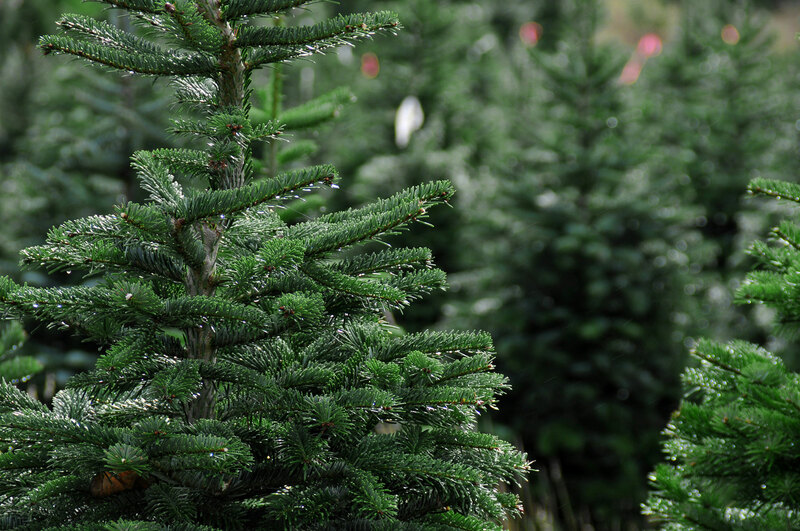 Make your home look Christmassy too and head out to a Vancouver garden centre of market to buy a Christmas tree. If you fancy chopping one down yourself you can do so at many places in the Lower Mainland. Here’s a great list of U-cut Christmas tree farms. The St Paul’s Hospital Lights of Hope takes place every year during winter in Vancouver. The front of the hospital on Burrard Street is lit up with lights and messages in stars from people who’ve donated to the hospital. Donations help support the hospital’s work. The VanDusen Festival of Lights features, amongst other attractions, a fireside lounge, dancing lights and a carousel. It sees the garden completely transformed and it’s very pretty. There’s also some tasty food on offer too. It sells out in the last week to Christmas so it’s best to book in advance (you can save money doing that too!). 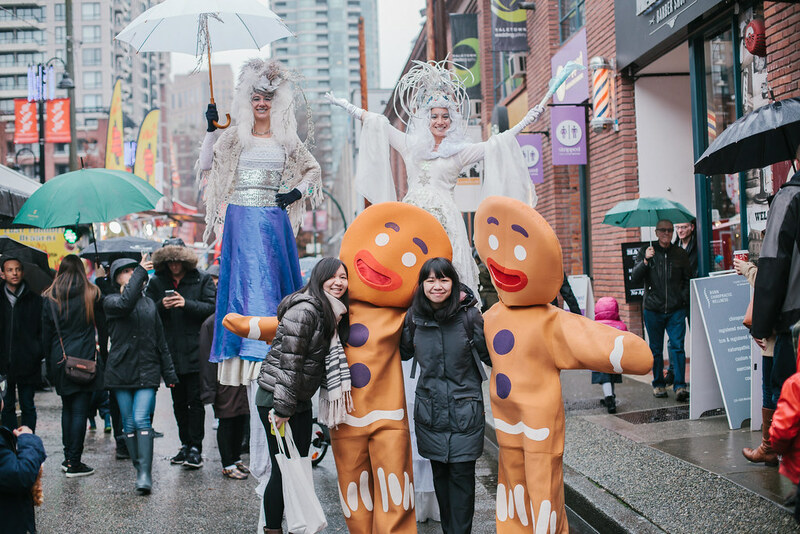 CandyTown is a free festival in Yaletown that helps to kick off the holidays. It sees Mainland Street turned into a winter wonderland with lights, candy canes and costumed characters. It’s a great time to make a start on your holiday shopping as well as get in the festive mood. There’s live music in the streets while you shop too! Say “hello” to the sweetest lane in the entire city. Gingerbread Lane is an event put on by the Hyatt Regency hotel. It runs from November 30th to December 28th and involves over 30 gingerbread creations designed by local secondary schools. The vent raises money for charity and the creations are incredible! The Circle Craft Christmas Market has over 300 artisans from across coast to coast. The market attracts thousands of people every year who are keen to get a head start on their Christmas shopping. You can shop everything from clothing to toys, jewellery, candles and more. Christmas is a great time to visit the Vancouver Aquarium. The aquarium is one of the most popular Vancouver places to visit and at Christmas many of the exhibits are given a festive overhaul. 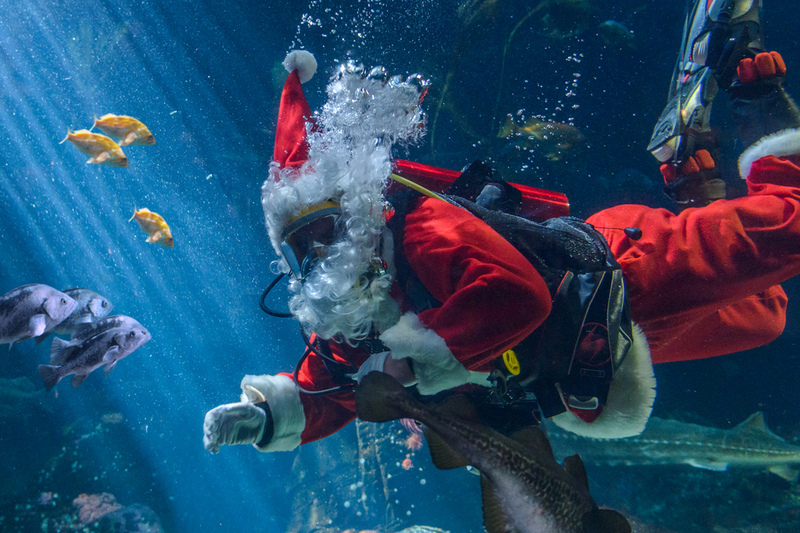 Not only can you see the amazing animals as usual but there’s a few additional ones: Scuba Claus and special seasonal activities too. The event usually runs from late November to early January. 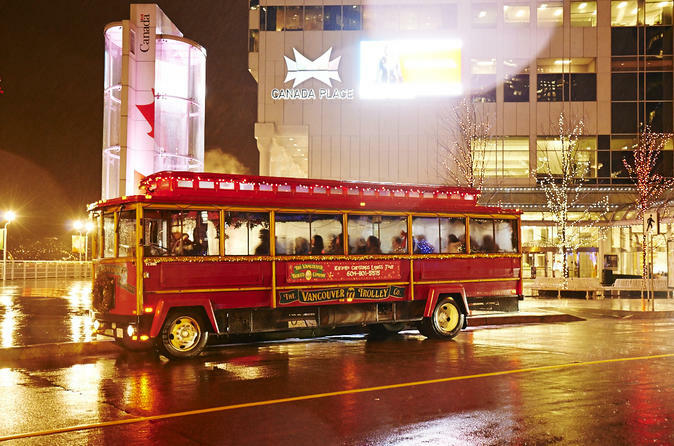 In winter the Vancouver Holiday Lights and Karaoke Trolley comes to town. There are two tour options: one round Bright Nights at Stanley Park, and the other to the VanDusen Festival of Lights. As you travel in the trolley there’s fun musical karaoke so that you really get into the holiday spirit. Head to Maple Ridge for a Christmas in the countryside at Timberline Country Christmas. At a 73 acre horse ranch in Maple Ridge you’ll find yourself in a Christmas wonderland. There are lights, festive music and more to get you in that festive mood. This Christmas event runs from December 1st to December 19. Over in Langley, the Glow Gardens run from November 22nd, to January 19th. There’s a Christmas market, a magical light display, Food and drink and a chance to ride Glen the Glow-comotive! This is a great thing to do with children in Vancouver, or with your grown-up friends too. Tickets are $23 for adults and $17 for children & seniors. Those 3 and under are free. In Coquitlam things get festive too thanks to the Lights at Lafarge event. The event opens on November 24th with live music and the light display that encircles the 1.2km Lafarge Lake loop. Expect food trucks, roving performers, music and more. If you’re wondering what to do in Vancouver, Canada this is one of the most magical Christmassy things. Vancouver’s Kitsilano neighbourhood likes to get in on the festive action too. The Kitsmas event runs throughout the holiday season to December 24 and makes your shopping experience in this Vancouver neighbourhood all the more enjoyable. There’s even free valet parking on some dates making this one of the most cool things to do in Vancouver. The Eastside Flea Holiday markets are a very fun place to get a start on your holiday shopping. The market takes place at 550 Malkin Avenue on November 16-17, December 1-2, 8-9, and 15-16 and are open from 11am – 5pm each weekend. Not only are there plenty of local vendors but there are food trucks, festive drinks and a whole lotta fun awaiting you. The Weirdos Holiday Market brings Vancouver’s most outlandish local artists and vendors together to showcase an eclectic array of all things unusual and unique. This market in Vancouver is for those looking for unusual gifts – perfect if you have someone who’s usually hard to buy for. The Weirdos Holiday market is open on Saturday, December 8th & Sunday, December 9th at 1739 Venables Street. One of the best things about Christmas is getting to put on that ugly Christmas sweater again. Vancouver has its very own ugly Christmas sweater party and Christmas sweater dash. The dates aren’t yet confirmed but you can find out about this year’s ugly Christmas sweater events in Vancouver here. It’s not all about the outdoors activities, if you’re looking for what to do in Vancouver in winter make sure to check out the local food scene. Here are some of the best food events going on in Vancouver this winter and some other great food and drink ideas to keep you warm! Cacao on Denman Street is a chocolate restaurant. They do pancakes and chocolate, chocolate fondue and hot chocolates. Plus a whole load more chocolate-y dishes. It’s a great place to head out for dessert, for brunch or just after a nice winter’s walk. Dine Out Vancouver runs from January 18th to February 3rd 2019 is an event that provides you with unique culinary experiences. There are guided dining adventures, spirited cocktail master classes, wine brunches, food tours and guest-chef collaboration dinners. If you consider yourself a foodie you simply have to go to at least one event! Taste BC happens in January and is a festival that celebrates BC’s finest wine, beer and spirits accompanied by delicious food from local restaurants. Need something to warm you up during the colder and damper winter weather in Vancouver? Good news! There’s a hot chocolate festival coming to town this winter. The festival runs for a few weeks at the end of January and each participant has it’s own special flavour (or flavours) of hot chocolate. The 2019 Vancouver International Wine Festival will take place from February 23rd to March 3rd. This wine festival is considered to be the best wine event in the whole of North America and sees hundreds of wine from all the world in one location, ready for you to taste. Tickets are on sale now and the price includes everything including the wine, tips and taxes for each event at the festival. There are so many breweries in Vancouver. There are loads towards Olympic Village (see my cycling guide for that one here) as well as the Port Moody Ale Trail. Round up your friends and head out on a self made brewery tour this winter. I love a good cocktail. Thom and I have been to a few places in Vancouver for cocktails over the last year or so and over winter cocktails get even better since they’re all warming and winter spiced. The Botanist: If you’re looking for super fancy cocktails head to The Botanist where you’ll find (expensive) smoke making cocktails, cocktails in amazing glasses and more. Prohibition: Prohibition is a hidden cocktail bar in the Rosewood Hotel. Go here before dinner to get a table and enjoy their extensive menu. Long Table Distillery: Gin lovers should head to Long Table Distillery. The gin is made there and the cocktails are great! Juniper: If you’re over by Chinatown then make sure you pop into Juniper. The cocktails there are very tasty and there’s a big menu too. Plus their food is great too! We had dinner there a few weeks ago and loved it. Brunch is the best for a rainy weekend where it’s not quite snow season but not quite hiking season. Luckily you’re spoilt for choice when it comes to brunch options in Vancouver. There’s Nelson the Seagull over in Gastown which is famous for its avo on toast, our local favourite the Red Umbrella in the West End and ever popular Medina and Jam Cafe both of which you’ll likely have to queue at. If you’re looking for things to do in downtown Vancouver during the evening or at the weekend this winter then check out these events coming to town! Robson Square has a huge, free (if you have your own skates) ice skating rink every winter. Renting skates costs $5. The skating takes place under a lit up roof and you’re right next to the Vancouver Christmas tree so it’ll feel super festive too. The 28th Annual Winter Solstice Lantern Festival takes place on 21st December 2018. This free community event happens all over Vancouver from Granville Island to Yaletown. Across the neighbourhoods there are glowing lanterns, fire performances and processions. It’s great fun to take part in. 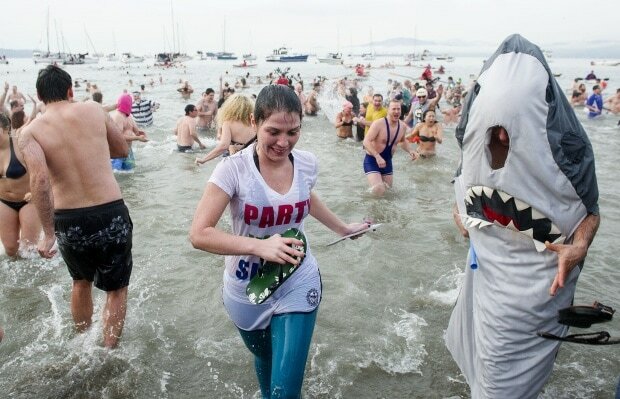 If you’re feeling brave then join the other Vancouverites on New Year’s Day and take a Polar Bear Plunge in English Bay. Yes, that’s right, jump into the cold waters. It’s a great cure for a hangover if nothing else! If you’re looking for indoor things to do in Vancouver, Canada when it’s raining then go give axe throwing a try! Axe throwing is great fun once you get past the initial fear of throwing an axe. 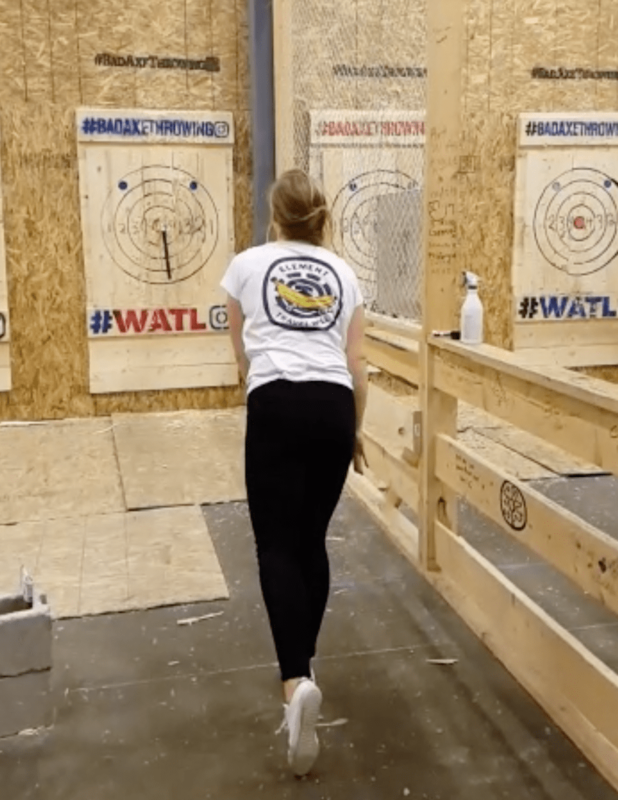 We’ve been to the one in Surrey – Bad Axe Throwing – which has walk-in availability most week days. If you’re going with a bigger group it’s best to book. Oh, and you can take your own beer too! The Scandinave Spa is high on my list of things to do near Vancouver this winter. It’s a spa up at Whistler that has a gorgeous looking outdoors area. You can get treatments or just pay to use their baths, saunas and steam rooms. The outdoor pools l look even prettier with a dusting of snow around them. Go support the local ice hockey team: The Vancouver Canucks. The Canucks play at the Rogers Arena downtown and it’s one of the best places to visit in Vancouver over winter since the games are always fun (even though Vancouver don’t win that often!). Hockey games are fast paced and extremely fun. If you want to be closer to the hockey action then head to watch the Vancouver Giants. Based down in Langley, the Giants play at a much smaller arena which means that wherever your seats are you’ll get great views of the action down on the ice. Plus these games tend to have a few more fights which is fun if you’re spectating. Spend the evening getting active at an indoor climbing gym. There’s a couple around Vancouver with the most popular being Cliffhanger which is right next door to The Hive Bouldering Gym. Cliffhanger have great beginner’s courses if you’re new to climbing and belaying (we did one a few month’s ago) and it’s a great way to build up your strength. The Aurora Winter Festival lets you escape into a hidden village by the North Pole right here in downtown Vancouver. It’s filled with light displays and magical characters, market huts, food gardens, amusement rides, live entertainment, visit Santa’s Workshop or lace up your skates on the Frozen River. The festival takes place at Vancouver’s Concord Pacific Place and from November 23rd to December 30th. It’s the place to be this winter – make sure to book tickets in advance. If you want to visit Science World but don’t want to deal with the school groups then go to a Science World After Dark event. These events happen once a month and are especially for those over 19. The building that houses Science World is also pretty cool looking at night which makes it one of the cool places to see in Vancouver. There are guest speakers, OMNIMAX® films and more to explore. Not only is the Museum of Anthropology in a beautiful looking building and but it’s full of interesting history. The museum teaches a lot about the Indigenous communities in Canada and it’s perfect if you’re wondering what to see in Vancouver or what to do on a rainy weekend. If you’ve been to this one check out the Museum of Vancouver as another one of the top places to go in Vancouver! Every Tuesday evening from 5pm-9pm the Vancouver Art Gallery has an “entrance by donation” event. This is perfect if there’s just one exhibition you want to see or didn’t want to spend all day browsing since you don’t have to pay the usual full entrance price. Want to do something different this winter? How about heading to the ballet? 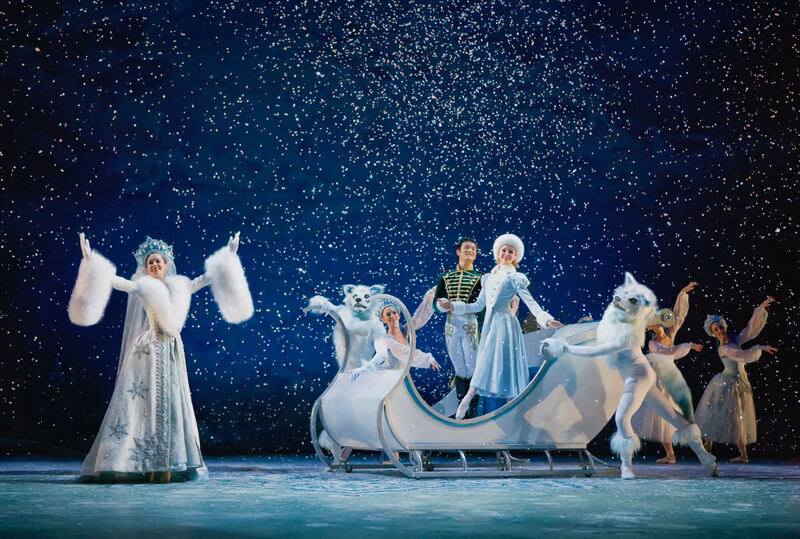 This year the Nutcracker Ballet is playing in early December and you can get tickets here. There are some great outdoors-y films playing in the cinemas right now. There’s ‘Free Solo’ the incredible documentary about Alex Honnold climbing up El Capitan in Yosemite National Park, the Dawn Wall featuring fellow climber Tommy Caldwell and the Banff Mountain Film Festival is touring too. I love the views from the Vancouver Lookout and they only get better in winter. I personally think it’s one of the top things to do in Vancouver. If there’s been some snow recently followed by a clear day then go up the Vancouver Lookout for incredible views of the snowy peaks and the city. On very clear days you can see Mount Baker over in Washington too! There’s a big Chinese population in the Vancouver area which makes it a great city to celebrate Chinese New Year in. Every year there’s a parade, a special version of Fly Over Canada and more going on around the city – especially in Chinatown and a little further south in Richmond. Lunarfest is an annual festival that happens around Chinese New Year. 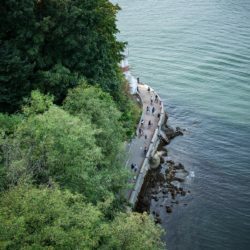 It’s great if you’re looking for things to do with kids in Vancouver since it’s super family friendly. As part of the festival you can expect the main celebrations to take place outside the Vancouver Art Gallery. Here there are crafts, fortune telling, live entertainment and more. Vancouver has so many good cafes. I have a few local favourites in the West End, there’s a tonne of cool ones in Gastown (they look good on your instagram grid too! ), and main street is the place to be if you’re a bit of a hipster. Grab your friends, a good book or go people watching in a new cafe. You never know, it could be your new fave! When it’s dark outside a pub is always a welcoming place. And if you’re bored of just grabbing a drink, why not unleash your competitive side and round up your friends for a pub quiz? Who knows what secret knowledge they have!? 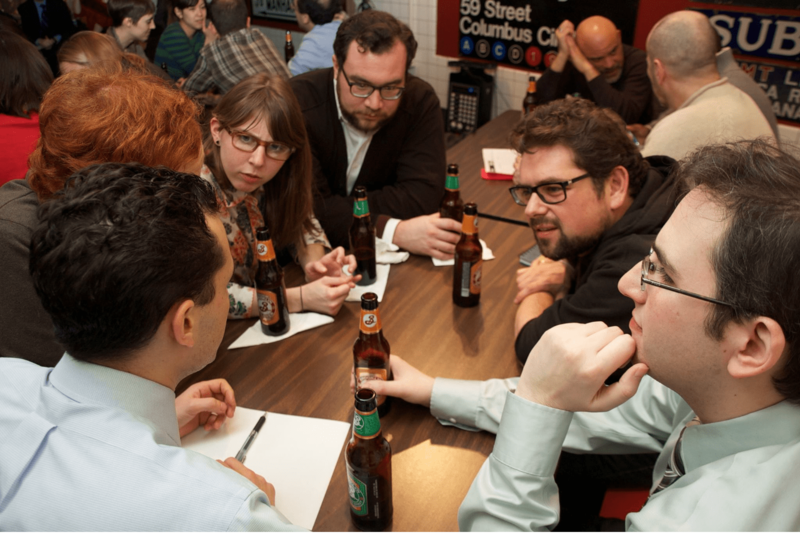 There’s a great list here of pub quizzes in Vancouver throughout the city. Just check with the pub first that they still happen as I’m not sure how old that list is! The No Pants Skytrain ride takes place every January and it’s exactly what it sounds like. You join in with a big group of people wearing no pants (/trousers) on the Skytrain. The event was created by Improv Anywhere and you can see what else they get up to here. Surely this is a Vancouver must see?! When the weather’s getting you down in dark Raincouver then head out to a comedy show to cheer yourself up. The three best comedy clubs as voted by locals this year are; The Comedy MIX on Burrard, Yuk Yuk’s Comedy Club on Cambie and Little Mountain Gallery in Mount Pleasant. There’s also an improv show regularly on Granville Island. Whilst I’m not one for playing a super long, strategic board game I do like the quicker ones on a rainy afternoon. If you and your friends don’t own any board games you can also head out to play them. There are a couple of pubs in the Vancouver area which have board games available to visitors such as Storm Crow Tavern. Or, better yet, there’s a whole board game cafe/restaurant in Chinatown. Pizzeria Ludica has a huge choice of board games to play. They also do a darn good pizza! If you’re looking for some outdoors things to do in winter that don’t include skiing then head up to Cypress Mountain and go on a cabin hunt. There are several hundred cabins hidden away in the forest that look super cute when covered in snow. This has to be one of the best things to do in North Vancouver in winter. Just be respectful though as these cabins are all privately owned and their owners might be there too. 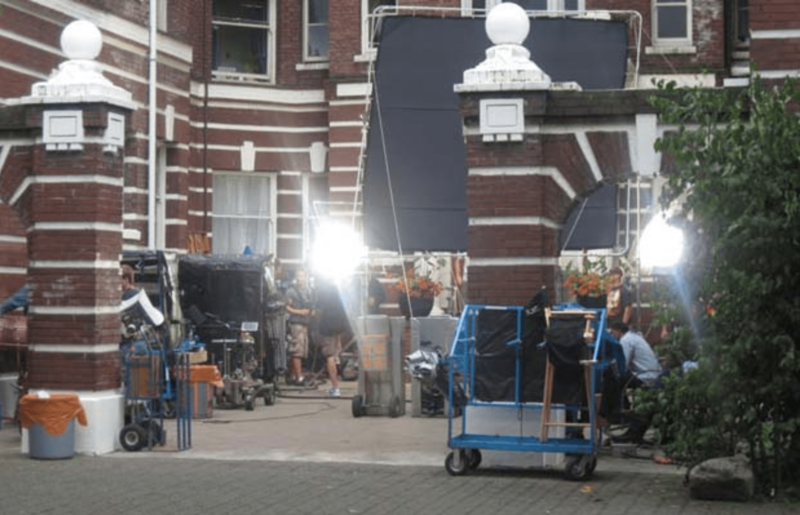 Whether you need things to do on a rainy day in Vancouver or are just looking for fun things to do in Vancouver then check out What’s Filming and go see a movie or TV production in action! Vancouver is home to many big movies and tv shows and the winter seems to bring even more film crews than the summer season! Using the site, create your own Vancouver tour this winter. Just because it’s snowy doesn’t mean you can’t road trip – some of the local surroundings look best when it’s snowed! A road trip is one of the best Vancouver activities come the winter season. Road trips are always on my top 10 things to do in Vancouver anyway! Make sure you’ve got winter tyres, snow chains where necessary and check the road conditions on DriveBC before you head off. It’s a good idea to have a blanket, shovel and some emergency provisions in case you break down too! The Whistler Film Festival from November 28 – December 2 shows up to 90 films from Canada and worldwide during its duration. If you’re in Whistler for a weekend of early skiing then make sure you stop by for a film at the Whistler Film Festival to finish off the day nicely. Take a road trip over to the greater Victoria area on Vancouver Island and visit Hatley Castle. This castle is a National Historic Site and is almost 100 years old. Nowadays it’s the admin centre for the Royal Roads University but it’s also featured in Deadpool, X-men and more. You can take a guided tour, or just wander around the grounds. 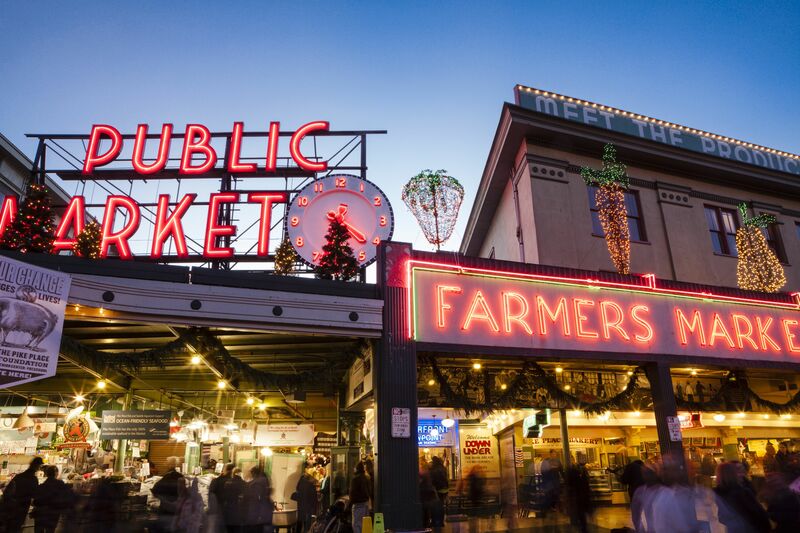 Once a year, Magic in the Market comes to Pike Place Market, for only one day usually towards the end of November. This year it’s on November 24th and takes place between 11am-5.30pm. There’s live music, cookie decorating, holiday treats and more. It’s definitely worth the road trip! If you’re looking for more things to do in Seattle take a look at my Seattle guide. BC has so many ski resorts. Of course there are our three local mountains in Vancouver, then Whistler further north but have you ventured east? That’s where the snow gets really good. Last year we did our own little skiing road trip to Revelstoke and SilverStar but that’s just scratching the surface of all the skiing there is to do out that way. Why not plan your own skiing road trip this year on BC’s powder highway? This is one of the best things to do in BC. Hot springs come into their own over winter. What’s better than soaking in a warm outdoors bath while surrounded by snow capped peaks? Not much, that’s what. There are so many picturesque cabins available to rent in the BC and northern Washington areas. Take a look on Airbnb and you’re sure to find some. Get a group of friends together to make it a more affordable getaway! I’ve got a list on Airbnb of some of my favourite local cabins! Plus, if you’ve never used Airbnb before you can get $45 off your first booking with this link! On December 21-23 and 27-30 from 10 a.m. to 5 p.m, it’s Christmas at Fort Langley. You can hear stories by the fire, eat freshly roasted chestnuts, and learn about the history of Fort Langley. 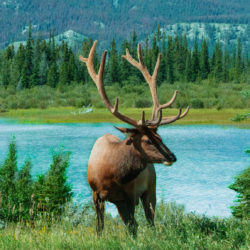 If you have a Parks Canada Discover Pass entry is free! The town of Leavenworth, WA is turned into a European Christmas market come winter. A road trip to Washington from Vancouver, BC is well worth it for this. It’s a ski town so usually feels pretty festive but when they aadd Christmas lights, trees and stockings it’s even prettier. 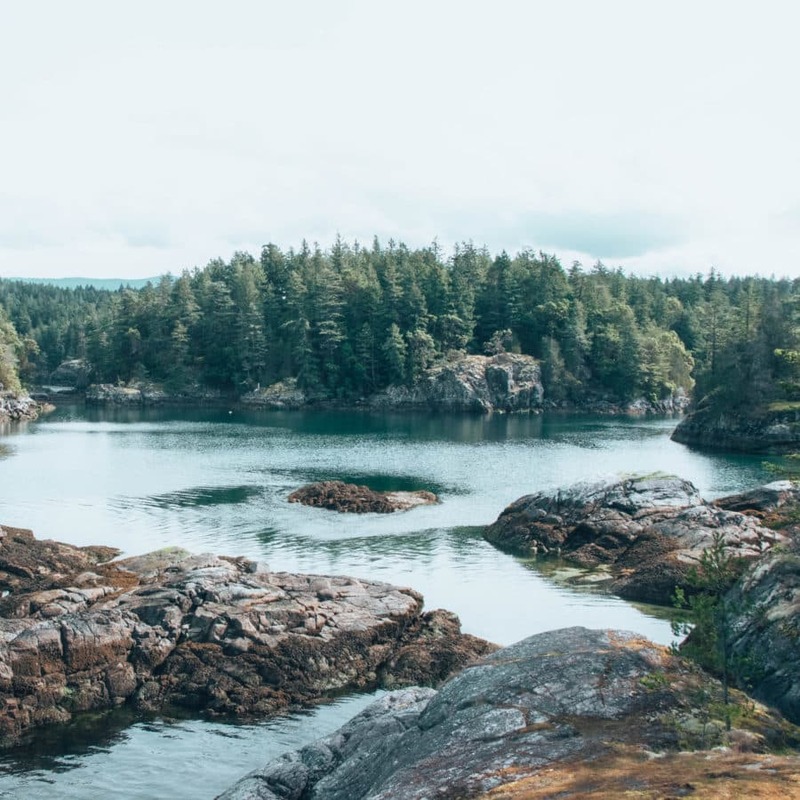 Tofino is always a good idea, it’s no surprise it’s such a popular weekend getaway from Vancouver. Whilst it’s nice to enjoy the sunshine on the beach, you could say it’s even more fun to watch the storms roll in in winter. Storm watching is one of the most popular things to do on Vancouver Island in winter. 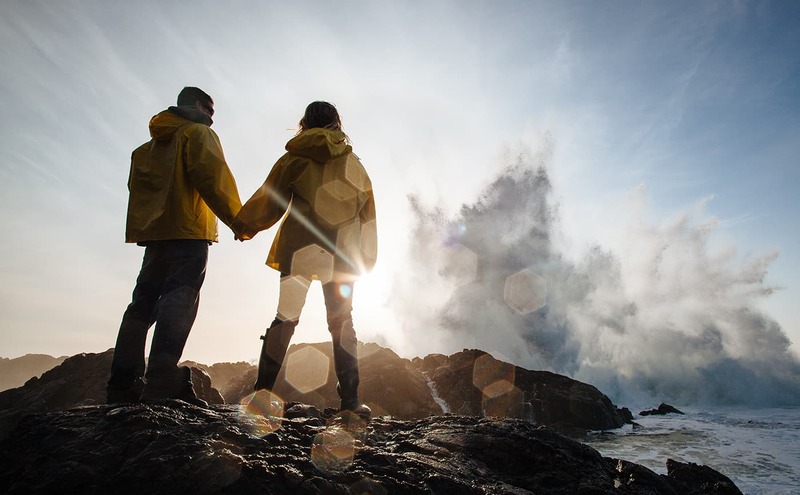 Wrap up warm, pack your waterproofs and go on a storm watching road trip to Tofino! If you happen to have a spare few thousand dollars lying around, or are an experienced backcountry skiier then check out these incredible Pemberton Ice Caves. Most people get here via ski-doo or helicopter, which explains the exorbitant costs of a trip, but the caves do look incredible. Wow, that’s a long list of things to do in Vancouver! I love the idea of viewing Christmas lights in the gorge. They’re so pretty aren’t they?! Your ideas are so awesome. At first I wanted to name what I liked best but then I had 20 more I wanted to try 😂The views, the city lights, the cabins, dog sledding.., everything is so beautiful. I think the city lights are one of my favourite because it’s so christmassy!